While I was searching for something suitably cute, frilly and silly for Auntie Anita's birthday present I came across this wonderful apron pattern. I also made some matching oven gloves (my own pattern) so Auntie Anita would have a fantastically stylish and overly frilly baking set! 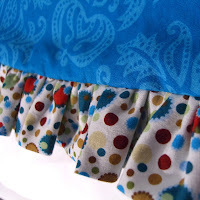 I really enjoyed making this apron - it was so fast - and the frills were so much fun! I then turned my attention to another birthday girl in our family - my sister-in-law Daphne. After asking Daphne what she would like for her birthday - she announced she would like some pot holders. "Pot holders?" I questioned. "Are you sure? You can have anything you want." "Pot holders." I was told. These pot holders were super easy to make (9"x9"). 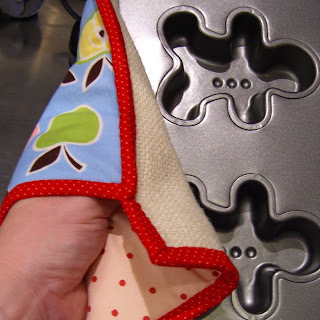 They have a pocket on the side so that you can have a secure grip on those hot pots and bakeware. I used one layer of cotton batting and one layer of heat resistant batting inside. And on the reverse I used hemp - which I thinks works quite well - at least I think it looks pretty and extra grippy at least! 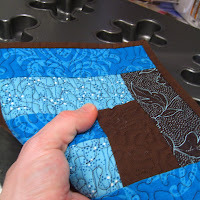 And then I made a series of five quilted pot holders (no glove pockets in these) ... ... that can be used for either gripping bakeware or as a pretty heat pad/mat for the table. 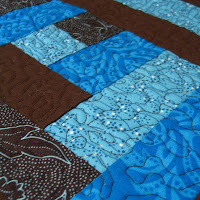 I had fun quilting these out of scraps and I got to practice some more free motion quilting. I hope these will all satisfy Daphne's desire for new pot holders! Nice, bright cheery gifts. 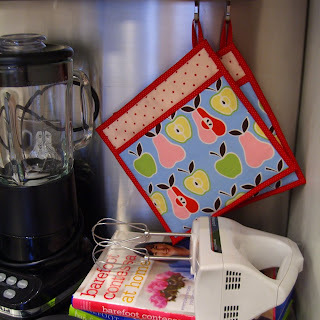 I like the potholders. I have a knitting pattern for potholders that I really like. I think I'll knit some up, mine are getting old. 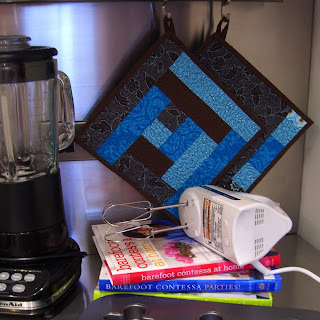 I love the pear pot holders and the blue/brown combo. Auntie Anita and Daphne are two lucky birthday people! Lovely gifts! You used some really great fabrics! What brilliant pot holders! 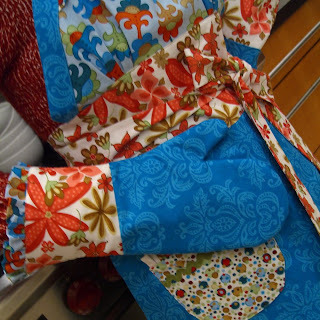 Great gift idea - love the different fabrics you have used. Great gifts. So bright and cheerful. What fabulous creations. 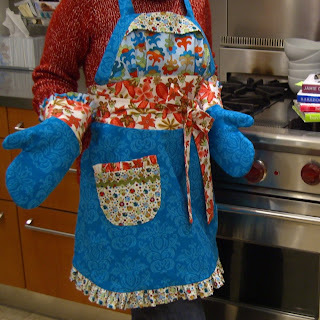 I love the apron, and the apple/pear pot holders are smokin'. 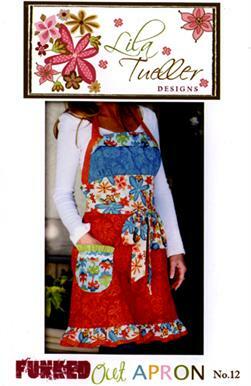 those pot holders are just lovely and so is your apron. What great presents to give. This is so cute and I really love those pot holders too. I've seen that apple fabric around and this is perfect for that. Nice projects and a pleasure to browse. I love these potholders Rachael, it is so nice to have someone appreciate a home made gift. 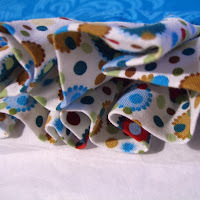 What great fabrics you use! Good eye! I would love being in my kitchen surround by those beauties. Those are lovely gifts. I know I probably wouldn't want to use them in my kitchen - I'd be too worried about spilling anything on them, as they look so good. The apron is so pretty Rachael, but the potholders are delicious! 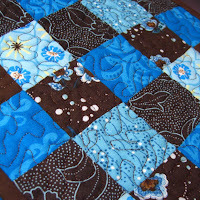 I just love your fabric choices - and the design is excellent. 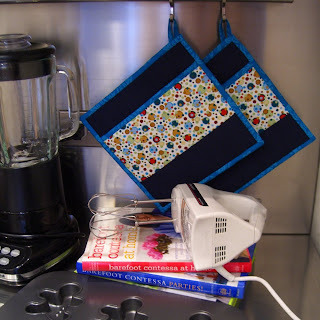 We were at Ikea the other day looking at potholders and they were so boring and bulky and unattractive we left them there - I'm heading for the sewing machine RIGHT NOW! I don't need any pot holders but yours are so lovely I would want them anyway. They are bound to be appreciated. Wow, you're on a roll! They look great!